The SERIES HFS800 filtration skids are designed to filter particulate from liquids with high flow rates. 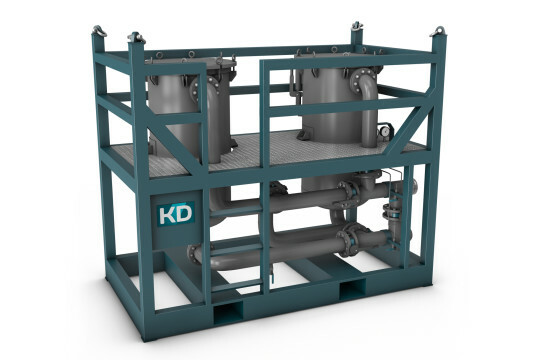 The duplex filtration skids are designed to be a portable complete filtration system and can be easily into service with little more than upstream and downstream connections being made. The filtration skid is designed and build to process specifics for the required flows and micron retain age. By Maintaining absolute fluid cleanliness, end- users can dramatically increase the life of critical wear components on rotational equipment, minimizing downtime and maximizing profitability. The filtration skids are offshore proof and equipped with all necessay valves, safety features and allows operators to simultaneously filter with one vessel and change out cartridges in the other vessel. All according to the latest design codes.